Adolf Hitler ordered the German invasion of Poland to begin on August 26, 1939. Troops, pan­zers, and air­craft had been lining up near Poland’s west­ern bor­der since mid-August. Though planned since late March 1939, the inva­sion was bound to rile Poland’s east­ern neigh­bor, the Soviet Union. That con­cern was laid to rest when, at the invita­tion of Joseph Stalin, Soviet Foreign Minis­ter Vya­cheslav Molo­tov and Ger­man Foreign Minis­ter Joachim von Rib­ben­trop inked a bi­lateral non-aggres­sion pact (Molotov-Ribben­trop Pact) in Mos­cow on August 24. The next day Hitler’s smirk of tri­umph was shred­ded by the “bomb­shell” that the Brit­ish and Polish govern­ments had con­cluded a mutual assis­tance pact that after­noon. On the evening of the 25th, when things looked dan­ger­ously out of con­trol, an irri­table Hitler issued a stop order and huddled with his ad­visers to con­coct a ploy to divert atten­tion away from their real objec­tive. Late on this date in 1939 Hitler and Rib­ben­trop handed the British am­bas­sador, Sir Nevile Hender­son, terms that would allegedly en­sure peace, not war. The Dan­zig en­clave and the Polish Cor­ri­dor were to be an­nexed by Ger­many, terms modi­fied the next day to holding a pleb­i­scite in the Polish Cor­ri­dor. Both terri­tories were viewed as the illegit­i­mate off­spring of the 1919 Ver­sailles peace settle­ment. Poles who had been born or had settled in those places after 1919 could not vote, while all Ger­mans born but not living there could. Safe­guards for Ger­man minori­ties living in Poland would have to be put in place. If Poland accepted these terms, Ger­many would agree to the Brit­ish demand to in­volve the Soviet Union in any settle­ment. A Polish pleni­po­ten­ti­ary with full powers to accept the terms was to arrive in Berlin by noon, August 30. The Poles, how­ever, would have nothing to do with a meeting in Ber­lin, sug­gesting instead a town near the Polish-Ger­man border. When the Polish am­bas­sador, Józef Lipski, visited Ribben­trop’s office on August 30, he too was pre­sented with Hitler’s demands. Because the am­bas­sa­dor lacked author­ity to en­dorse the Ger­many’s terms, Rib­ben­trop ended the meeting. Soon Ger­man radios blared reports that Poland had rejected Ger­many’s offer. The diplo­matic do-si-do was a hoax on every­one. Hitler had no inten­tion of acting on his own offer. Troops, armor, and air­planes were in place, set to launch on September 1. 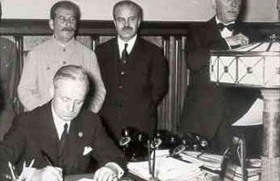 Left: German Foreign Minister Joachim von Ribbentrop signs the German-Soviet Non-Aggres­sion Pact, Mos­cow, August 1939. Behind him is Soviet leader Joseph Stalin and, to his left, Soviet Foreign Minister Vya­cheslav Molo­tov. The pact had a secret proto­col that par­celed out half of Poland, sand­wiched between the two states, to each signa­tory in the event of a Ger­man inva­sion of Poland. Hitler believed that the pact pro­tected his east­ern flank when the inevi­table war with Poland came. But in truth the near simul­ta­neous inva­sions of Poland by Ger­many (on Septem­ber 1, 1939) and the Soviet Union (on Septem­ber 17, 1939) brought Hitler face to face with a rapidly arming colos­sus whose leader had no inten­tion of giving Ger­many a free hand on his west­ern fron­tier. Opera­tion Bar­ba­rossa, Hitler’s inva­sion of the Soviet Union in June 1941, offered the pros­pect of nipping in the bud the threat Stalin’s machi­na­tions might have in Germany’s Polish conquests. 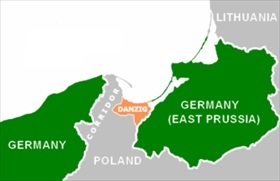 Right: Areas on Germany’s eastern frontier where Hitler pro­posed terri­torial “readjust­ments”; namely, the Polish Cor­ri­dor and the Dan­zig en­clave (“Free City of Dan­zig,” today’s Gdańsk), two of Germany’s so-called “lost territories.” During the last week of August 1939, Poland’s Western allies—Great Britain and France—made it clear that Ger­man-Polish relations were key to Euro­pean war or peace. An argu­ment can be made that Great Britain and France pro­pelled them­selves into the dead­liest war in his­tory by guaran­teeing the Poles (who had their own national agen­da) their inde­pen­dence earlier in the year (March 31, 1939) and then for­malizing that guaran­tee on August 25, 1939, in a mutual mili­tary alli­ance directed against Ger­many. Turning their back on that August guaran­tee to Poland would have brought national dishonor to both Western democracies.